US Navy Captain Mark Matthews explained the vehicle had exceeded its programmed operational limit and automatically resurfaced. "There's certain abort criteria that the vehicle has as it's executing its mission," he told CNN from Perth. "If there's certain conditions that occur, it stops and it comes to the surface. "In this case the vehicle's programmed to fly 30 metres over the floor of the ocean to get a good mapping of what's beneath." Charts put the depth at 4,200-4,400 metres, he said. "It went to 4,500 metres and once it hit that max depth, it said this is deeper that I'm programmed to be, so it aborted the mission." Matthews, a search and recovery expert, said the crew would now refine the task to cope with the depth encountered. "It happened in the very far corner of the area it's searching. So they are just shifting the search box a little bit away from that deep water." The US-made Autonomous Underwater Vehicle (AUV) Bluefin-21 would embark on a second mission during the day, weather permitting, Australia's Joint Agency Coordination Centre (JACC) said. JACC chief Angus Houston had announced Monday the end of weeks of listening for signals from the plane's black boxes and the launch of submarine operations. The vehicle would survey the silty ocean floor for 16 hours at a time to gather a maximum amount of data, he said. "Bluefin-21 is planned to redeploy later today when weather conditions permit," JACC added. The forecast for the search zone 2,170 kilometres northwest of Perth is southeasterly winds with scattered showers and isolated thunderstorms, sea swells up to two metres (nearly seven feet) and visibility of five kilometres (three miles). Baseless!! Since when are witness accounts considered "baseless"? Why does Harvey Sernovitz ... the spokesperson for the Embassy ... fail to address the Kuda Huvadhoo witnesses who claim that they now only heard and also observed a "low flying plane" on the morning of March 8th ... a "low flying plane" headed towards the island of Diego Garcia? Why would MH370 make a deliberate turn off the established flight path with the purpose of ditching it hours later in the Indian Ocean? It does not make sense. KUALA LUMPUR: WASHINGTON has strongly refuted all allegations of a cover-up in the mystery surrounding the disappearance of Malaysia Airlines flight MH370. As discussions, including on social media, on United States purported role behind the Boeing jetliner going missing continue to swirl, Washington, through its embassy here, said that they were all "baseless conspiracy theories". The US Embassy here, in an email to the New Straits Times, said claims that MH370 was hidden somewhere in its island military base, Diego Garcia, were also wild allegations. "This is a baseless conspiracy theory that has already been debunked around the world, and the White House Press Secretary specifically addressed this on March 18," said the embassy's press attaché Harvey Sernovitz. Washington also addressed allegations that logs at Diego Garcia from March 8 to 10, had been wiped clean. "These reports are completely false. MH370 did not land in Diego Garcia. This is a baseless conspiracy theory." Sernovitz said his government also denied that they had withheld information from Kuala Lumpur that could help with investigations. Eyewitnesses from the Kuda Huvadhoo concurred that the aeroplane was travelling North to South-East, towards the Southern tip of the Maldives – Addu. They also noted the incredibly loud noise that the flight made when it flew over the island. "I've never seen a jet flying so low over our island before. We've seen seaplanes, but I'm sure that this was not one of those. I could even make out the doors on the plane clearly," said an eyewitness. "It's not just me either, several other residents have reported seeing the exact same thing. Some people got out of their houses to see what was causing the tremendous noise too." Mohamed Zaheem, the Island Councilor of Kuda Huvadhoo, said that the residents of the island had spoken about the incident. The Malaysia airlines jet disappeared on March 8 with 239 people on board after taking off from Kuala Lumpur bound for Beijing. Investigators say it was deliberately diverted off course. 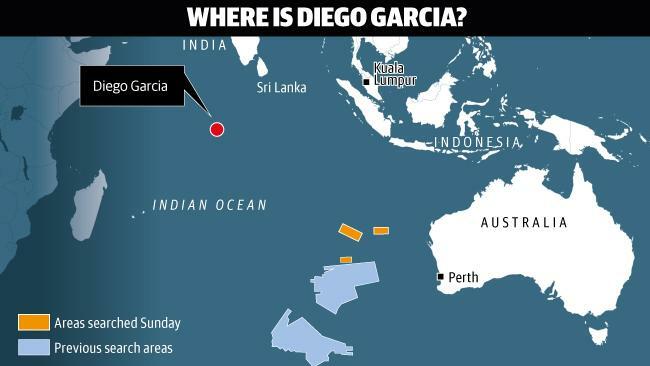 Satellite data suggests that the last "ping" was recieved from the flight somwhere close to the Maldives and the US naval base on Diego Garcia. Did missing Malaysia Airlines flight MH370 fly to little lost island of Diego Garcia? SITTING like a misshapen wishbone in the vast expanse of the Indian Ocean, Diego Garcia is one of the world’s most remote locations. Administered by the United Kingdom but home to a US Naval Base, the island has had no indigenous inhabitants since they were forcibly relocated to other islands in the Chagos Archipelago, as well as Mauritius and the Seychelles, in 1971. The island is so little-known that it has been rumoured that the US authorities have used it as a base for a secret prison. Even its name is suggestive of a Bond villain. The island, which is 3600km from Africa’s east coast and 4700km northwest of Australia, is home to 1700 military personnel and 1500 civilian contractors. It has a runway large enough to accommodate commercial aircraft — and was even deemed suitable for a landing by the US Space Shuttles in the event of an emergency. Because of its remoteness and its runway, Diego Garcia has been suggested as a possible location for missing Malaysia Airlines flight MH370. This theory was given some credence when it was discovered that the island’s landing strip was programmed into the home flight simulator of MH370’s pilot, Captain Zaharie Shah. An FBI investigation found “nothing sinister” about the flight simulator files, but attention has returned to MH370’s pilot after it was reported that the plane had deliberately avoided radar detection in the early hours of March 8 by skirting around Indonesian airspace. PERTH, Australia - A robotic submarine looking for the lost Malaysian jet began its second mission Tuesday after cutting short its first trip, officials said. The submarine hunting for Malaysia Airlines Flight 370 aborted its first mission after only six hours, surfacing with no new clues when it exceeded its maximum depth along the floor of the Indian Ocean, officials said Tuesday. Investigators analyzed the data it collected and said they found "nothing of interest". The Bluefin 21 was not damaged and the U.S. Navy plans to deploy it again. Crews were shifting the Bluefin's search area away from the deepest water and were hoping to send it back on another mission later Tuesday. Meanwhile, up to eleven planes and eleven ships have been scouring the surface looking for debris. Though authorities have said they believe that the chance of finding floating debris on the surface has "greatly diminished". Search authorities had known the primary search area for Flight 370 was near the limit of the Bluefin's dive capabilities. Deeper-diving submersibles have been evaluated, but none is yet available to help. The weekslong surface search is expected to end in the next two days. Officials haven't found a single piece of debris confirmed to be from the plane, and Houston said the chances that any would be found have "greatly diminished." CNN) -- The underwater probe being used to look for missing Malaysia Airlines Flight 370 was back in the water after its first attempt ended prematurely, said the company that owns the vehicle, Phoenix International. The Bluefin-21 autonomous underwater vehicle was about four hours into its second dive mission at 2 p.m. ET on Tuesday (2 a.m. Wednesday in Perth, Australia), a source close to the operation told CNN's Brian Todd. The second mission is expected to end Wednesday around 10 a.m. ET (10 p.m. in Perth), the source said. The vehicle was deployed in nearly the same area and is operating at about the same depth as the earlier mission, the source said. The earlier aborted mission doesn't mean anything is wrong with the probe, which is designed to swim about 30 meters (100 feet) above the ocean floor and use sound waves to draw a three-dimensional map of what lies below. The vehicle's tracking the floor, so when the floor dives, so does the vehicle. And the vehicle goes, 'Uh oh, I'm not supposed to be here' and punches up," said David Gallo, director of special projects at the Woods Hole Oceanographic Institution. And while it's disappointing the vehicle returned to the surface early, it's not unusual, said David Kelly, CEO of Bluefin Robotics, the company that makes the probe. "We've operated these vehicles around the globe. It's not unusual to get into areas where the charts aren't accurate or you lack information," Kelly told CNN's "Erin Burnett OutFront." A British survey ship is working to determine the areas where the Bluefin can safely work without hitting its maximum dive depth, according to Phoenix. U.S. Navy Capt. Mark Mathews of the Bluefin search team said the initial launch Monday night took place "in the very far corner of the area it's searching, so they are just shifting the search box a little bit away from that deep water and proceeding with the search." About 8 square miles were searched, said Jim Gibson, a spokesman for Phoenix International. It could take up to two months to scan the entire search area. The deputy director for salvage and diving for the U.S. Navy told CNN that the Bluefin may actually be able to go deeper than it was first programmed to do, engineers have determined. "We've gone through and looked at all of the components in Bluefin, and we're comfortable that we can exceed that 4,500-meter limit at this point," Mike Dean told CNN's "The Lead with Jake Tapper. "We're looking at, can we push Bluefin beyond 4,500, potentially down to as deep as 5,000? There is some software, that software has been tested now. And we believe that, with some confidence, we could push Bluefin to that depth." He said two-thirds of the search area was less than 4,500 meters deep. Dean said the Bluefin was chosen for this part of the search because it was the lightest, most nimble package and easiest to get on scene. It's possible that a second vehicle that can operate deeper than the Bluefin will be needed. One possibility is a vehicle called Orion that is towed behind a ship. It remains under the water and sends back real-time data. It would be a more complex operation to put an Orion in the water but one is available in Maryland if the Australian-led search team requests it. Up to 11 military aircraft, three civil aircraft and 11 ships will assist in today's search for missing Malaysia Airlines flight MH370. Today the Australian Maritime Safety Authority has planned a visual search area totalling approximately 55,151 square kilometres. The centre of the search areas lies approximately 2,087 kilometres north west of Perth. The Autonomous Underwater Vehicle was again deployed last night from ADV Ocean Shield. 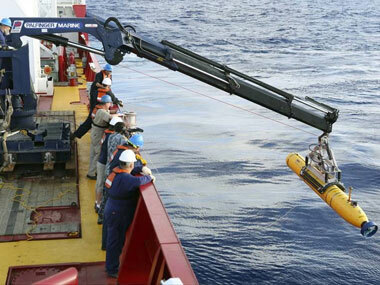 The data from Bluefin-21's first mission has been downloaded and analysed. No objects of interest were found. The weather forecast for today is south easterly winds with isolated rain showers, sea swells up to two metres and visibility of five kilometres. The Autonomous Underwater Vehicle, Bluefin-21, was forced to resurface this morning to rectify a technical issue. While on deck, its data was downloaded. Bluefin-21 was then redeployed and it is currently continuing its underwater search. Initial analysis of the data downloaded this morning indicates no significant detections. KUALA LUMPUR, Malaysia–Malaysia said Wednesday it has dispatched another ship to aid in the search for Malaysia Airlines Flight 370 in the southern Indian Ocean. Defense Minister Hishammuddin Hussein said that Bunga Mas 6, an auxiliary ship of the Royal Malaysian Navy, was en route to the base of a multinational search party in Perth, Australia, hunting for the missing jet. “It shows that the effort for search and rescue, especially on the part of Malaysia, is not slowing down,” Mr. Hishammuddin told reporters on the sidelines of a defense exhibition in Kuala Lumpur. The best leads in an underwater search for Malaysia Airlines Flight 370 will be exhausted in about a week, Australian Prime Minister Tony Abbott said. BEIJING — A robotic submarine dived into the ocean to look for lost Flight 370 for a third time while the head of an Australian water wreckage recovery firm says he believes searchers have honed in on the location of the plane. Meanwhile, the families of Chinese passengers who were on the plane that disappeared March 8 lashed out at Malaysia authorities for not telling them what is going on. "You are all bloody liars and you are lying to us again now," one relative shouted at a teleconference in Beijing with high-level Malaysian government and airline officials in Kuala Lumpur. "You have absolutely no shame." Off Australia's western coast, the U.S. Navy Bluefin 21 sub surfaced early for the second time in as many missions, this time after experiencing technical difficulties. It was sent back into the water after its data were downloaded but there's been no sign of the plane, according to the search coordinator. David Mearns, who heads British-based Bluewater Recoveries but is not involved in the search effort, told the Australian Broadcasting Corporation that he believes the sounds picked up days ago by sonar devices are from the data recorders of the missing plane. He said that would mean the wreckage of the plane is in the general area of the Indian Ocean that searchers are in, and it is just a matter now of locating the wreckage by sight. "Obviously for the sake of the families and for everybody else they will want photographic proof and that will be coming shortly," Mearns said. (CNN) -- Families of some of the missing Malaysia Airlines Flight 370 passengers released a list of questions Wednesday that they said authorities have so far not answered. ELTs are designed to activate after a crash and send a signal to a frequency monitored by air traffic controllers. "Black boxes," or voice and data recorders, could shed light on what went on in the plane's cockpit and other crucial flight information. The families' final seven questions involve "protocol," including this: What did Malaysia Airlines do when the flight went missing? The families also ask whether search and rescue teams have final results from searched areas, and whether the Malaysian government could specify the rights of family members "to know the facts of cases or the details of an incident." The questions were posted on the social media site Weibo by a committee in Beijing representing some of the passengers' families. Some of the "questions" are requests that evidence be shared with them, including the flight's logbook and air traffic control audio. Malaysia Airlines, for its part, has said it shares all the information it has with appropriate authorities. Flight 370 lawsuits against Boeing might not get heard in U.S.
(AP) — Since Malaysia Airlines Flight 370 went missing, some lawyers have claimed they can get several millions of dollars in damages for each lost passenger by taking the cases to the United States. But past lawsuits show U.S. federal courts are more likely to throw such cases out if the crashes happened overseas. Some lawyers have argued that the families could still sue in America if they alleged the plane's U.S. manufacturer, the Boeing Co., was somehow responsible for the disaster. But such lawsuits are likely to be rejected if they're filed in the United States because federal courts there have dismissed many similar foreign air crash cases, especially if most of the plaintiffs are not American. Major disasters draw lawyers looking to sign up clients for big lawsuits, and the missing Malaysian plane, which was carrying mostly Chinese passengers, has been no exception. Lawyers from various firms have descended on a Beijing hotel where relatives of the passengers have been staying, and have even traveled around China to visit them in their homes. The Chinese relatives have said their main focus remains on the search for the plane, so lawyers have had little luck so far in signing up clients here, despite dangling the potential of major damage awards. "This is not the right point in time to discuss legal matters because nothing has been found yet and everybody has no idea what exactly happened to the plane," said Steve Wang, a representative of some of the Chinese relatives. Relatives can expect to get at least about $175,000 from Malaysia Airlines for each lost passenger under terms of the Montreal Convention, an international treaty governing air travel compensation. The relatives can also sue the carrier in Malaysia or their home countries for further damages. The Philip Wood conspiracy? I believe that this was a hoax to call attention to the possibility that MH370 landed on Diego Garcia. Nevertheless ... my pilot SIL and colleagues cannot comprehend why Diego Garcia was not the focus of investigators when it was first learned that MH370 was tracked taking a turn back to Malyasia and headed west toward the Indian Ocean. Think about it. If the intent was to crash ... not land the plane ... the deed could have been done in the South China Sea somewhere between Malaysia and Beijing rather than the Southern Indian Ocean. Also ... when info regarding the landing strip on Diego Garcia that was revealed in the pilot's flight simulator is considered and ... the observation of those on the Maldives island of Kuda Huvadhoo who witnessed a low flying plane on the morning of March 8th ... a low flying plane headed towards Diego Garcia is considered ... my 16 year old grandson and I have become believers along with his father that there may been a Diego Garcia conspiracy. Maybe another "Edward Snowden" will emerge who will blow wide open a cover up regarding a westerly route taken by MH370 on the morning of March 8th? On the other hand ... maybe the current search will reveal that the route of MH370 took a turn South after flying west across Malaysia towards the Indian Ocean. In other words ... I can speculate all I want but in the end "what will be; will be". My grandson? Yes ... time does fly. His future? A Karate instructor? Christian hip hop performer? An international pilot? The possibilities seem endless when you are 16 years old. My prayer is that whatever his life choices ... they will be honouring to God and his parents. Up to ten military aircraft, two civil aircraft and 11 ships will assist in today's search for missing Malaysia Airlines flight MH370. Today the Australian Maritime Safety Authority has planned a visual search area totalling approximately 40,349 square kilometres. The centre of the search areas lies approximately 2,170 kilometres north west of Perth. Overnight Bluefin-21 AUV completed a full mission in the search area and is currently planning for its next mission. Bluefin-21 has searched approximately 90 square kilometres to date and the data from its latest mission is being analysed. The oil sample collected by Ocean Shield has now arrived in Perth and will be subject to detailed testing and analysis. We will provide details of the results when they become available. SYDNEY—The best leads in an underwater search for Malaysia Airlines 3786.KU +6.98% Flight 370 will be exhausted in about a week, Australia's Prime Minister Tony Abbott said Wednesday, as searchers battled to overcome technical issues that have hampered early efforts to scan the Indian Ocean's seabed. "We believe that search will be completed within a week or so," Mr. Abbott told The Wall Street Journal in an interview. "If we don't find wreckage, we stop, we regroup, we reconsider." That air and sea search for floating debris is nearing its end, Australia's Defense Minister David Johnston said in an interview, and any final decision will be made on advice from senior military and search officials. A total of 14 aircraft and 11 ships scanned the ocean surface Wednesday. "It is obviously becoming less and less optimistic," Mr. Johnston said of the aerial search. Any potential debris field is likely to have "dissipated to the four winds," or sunk, he said. Authorities have several options available if the current underwater search by Bluefin-21 turns up nothing. They could order a second sweep of the seabed in a tight area where the first signals believed to have come from Flight 370's black boxes were detected. The search could also be expanded to a wider area around a series of transmissions heard on four occasions covering 500 square miles. U.S. Navy commanders have said a search on that scale could take six to eight weeks to complete. Martin Dolan, chief commissioner of the Australian Transport Safety Bureau, said a later phase could involve a search along a wide arc of sea extrapolated from a partial digital "handshake" between Flight 370 and an Inmarsat ISAT.LN +0.68% PLC satellite. That strip of sea is more than 370 miles long and 30 miles wide, according to search maps. With authorities uncertain about the depths of the ocean, other organizations are ready to provide submersibles that can go deeper than Bluefin-21. According to David G. Gallo, director of special projects at the U.S.-based Woods Hole Oceanographic Institution, two Remus 6000 underwater vehicles together costing US$20,000 a day to operate could be flown to Perth if required. Those submersibles were used in 2011 to locate the black boxes of Air France 447, which crashed in the Atlantic Ocean two years earlier. Mr. Dolan, Australia's top air-accident investigator, said a prolonged undersea search and salvage mission using privately owned equipment could cost up to 250 million Australian dollars (US$234 million). Mr. Johnston also said the underwater search may ultimately end up being run mainly by private companies, although he declined to estimate what that could cost. "Ultimately it may well be that there is a civilian contractor to come and pick up the pieces if we have no success," said Mr. Johnston. Payment of search and salvage contractors would likely need to be negotiated between Malaysia, who operated the aircraft, the U.S., where the plane was built, and China, where the majority of passengers came from, Mr. Johnston said. A combination of cutting-edge science, dogged analysis and simple luck prompted searchers to focus the hunt for Malaysia Airlines 3786.KU +6.98% Flight 370 underwater, just days before the plane's black box recorders were expected to fall silent. Authorities got a first look at the sea floor Tuesday in an area that they believe is the jet's likely location, without detecting any wreckage. Hopes rest on a remote-controlled submersible from the U.S. Navy, which is seeking the first visual confirmation of wreckage that could lead investigators to the all-important recorders. It's a turn of events that seemed unimaginable less than two weeks ago, after an extensive air and sea hunt for surface debris had turned up little more than garbage. The frequent and seemingly fruitless shifts in the aerial search frustrated investigators and eroded the confidence of the public and families of the victims. The current effort may yet turn out to be another false lead. But over the past 11 days, an international team of experts has persistently recalibrated data and capitalized on new streams of information to zero in on a tight corridor in the southern Indian Ocean, according to senior Australian government officials, investigators from several countries and others briefed on the probe. The decision to narrow the search on April 4 amounted to a carefully calculated gamble. Investigators incorporated arcane new calculations reflecting changes in the operating temperatures of an Inmarsat ISAT.LN +0.68% PLC satellite as well as the communications equipment aboard the Boeing BA +1.42% 777 when the two systems exchanged so-called digital handshakes. Those links occurred regularly for some six hours after the plane deviated from its original flight path to Beijing from Kuala Lumpur, and then headed south. The new analysis provided investigators with a "sweet spot" to begin the underwater search, initially using a black-box detector in an area of sea some 500 kilometers to the north of where military aircraft and ships had previously been looking, said Martin Dolan, chief commissioner of the Australian Transport Safety Bureau. The international working group established by Malaysia to investigate the crash, which included U.S., British, and French technical experts, assembled the new analysis, which the ATSB vetted before incorporating into the Australian-lead search. At the recent media conference conducted by the Chief Coordinator of the Joint Agency Coordination Centre, Air Chief Marshal Angus Houston (Ret'd), said that the Australian Defence Vessel Ocean Shield had detected an oil slick on Sunday evening in her current search area. Preliminary analysis of the sample collected by ADV Ocean Shield has confirmed that it is not aircraft engine oil or hydraulic fluid. Additionally, Phoenix International, with the assistance of Bluefin, have assessed that there is a small but acceptable level of risk in operating the vehicle in depths in excess of 4,500 metres. This expansion of the operating parameters allows the Bluefin-21 to search the sea floor within the predicted limits of the current search area. Some media reports today state that it would take Bluefin-21 anywhere from six weeks to two months to scan the entire underwater search area. This is incorrect. Since the US Navy provided comment some days ago, the underwater search has been significantly narrowed through detailed acoustic analysis conducted on the four signal detections made by the Towed Pinger Locator on ADV Ocean Shield. This analysis has allowed the definition of a reduced and more focused underwater search area. This represents the best lead we have in relation to missing flight MH370 and where the current underwater search efforts are being pursued to their completion so we can either confirm or discount the area as the final resting place of MH370.